In my last post, I ‘contradicted’ James Bullard´s “monetary policy is regime dependent” assertion. I tried to show that the opposite is true, with regimes being monetary policy dependent. The panel portrays three regimes – Great Inflation, Great Moderation and Great Stagnation. The associated monetary policy is described by the behavior of NGDP. To facilitate comparison, each line in the panel has the same scale, while each column depicts a different regime. If you want rising inflation and a high volatility regime, just choose high/rising NGDP growth. Stable NGDP growth will provide nominal stability and low volatility. 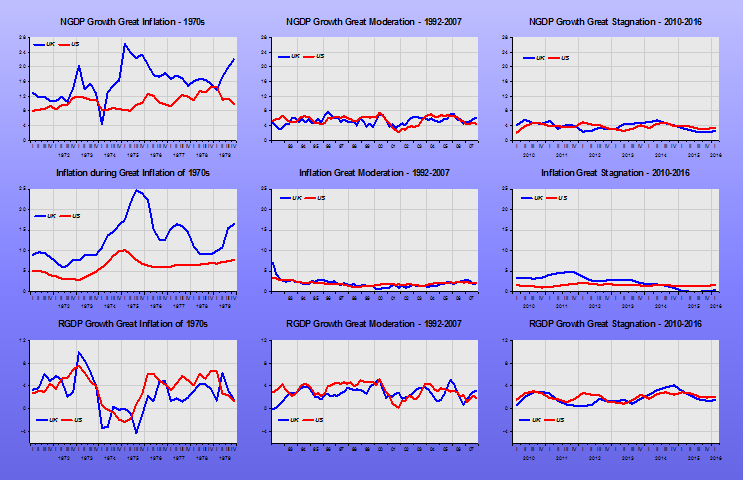 Note the “greatest inflation” in the UK going hand in hand with “fantastic” NGDP growth. 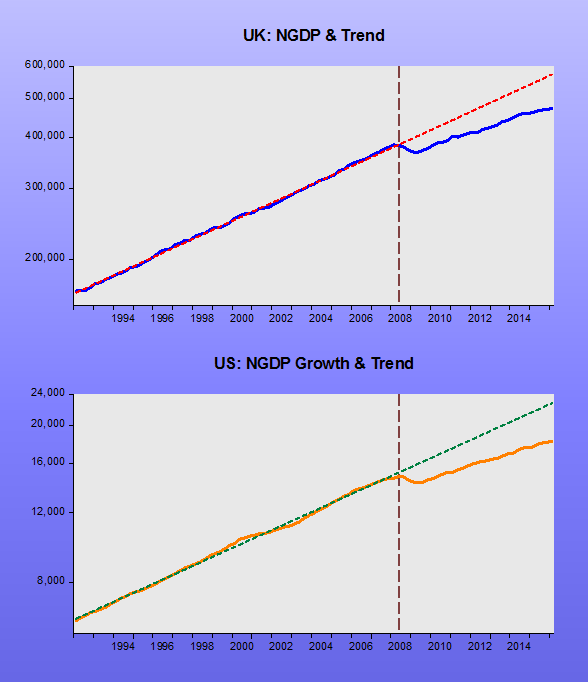 Differences in RGDP growth are relatively minor. However, nominal stability and low volatility can also give you the Great Stagnation! Therefore, it is important to get the LEVEL of nominal stability right. That´s why market monetarists push for NGDP Level Targeting. As the charts show, central banks in the US, UK (and also in the Eurozone), through a misguided focus on headline inflation, let the “ball drop” and never tried to bring the LEVEL of spending back up. The outcome has been a more fragile system, one that can be strongly affected by different shocks. A case in point is Brexit and Italy. The St. Louis Fed had been using an older narrative since the financial crisis ended. That narrative has now likely outlived its usefulness, and so it is being replaced by a new narrative. The hallmark of the new narrative is to think of medium- and longer-term macroeconomic outcomes in terms of regimes. In this new narrative, the concept of a single, long-run steady state to which the economy is converging is abandoned, and is replaced by a set of possible regimes that the economy may visit. Regimes are generally viewed as persistent, and optimal monetary policy is viewed as regime dependent. Switches between regimes are viewed as not forecastable. Unfortunately, Bullard gets it wrong. It is not monetary policy that is regime dependent but regimes that are monetary policy dependent. In other words, the Fed is not passive, but instrumental in building regimes. History is very clear on that point. In the 1960s, monetary policy worked double-shift to build the high inflation (“Great Inflation”) regime that blossomed in the 1970s. We are in the transitional period of cost-push inﬂation, and we therefore need to adjust our policies to the special character of the inﬂationary pressures that we are now experiencing. An effort to offset, through monetary and ﬁscal restraints, all of the upward push that rising costs are now exerting on prices would be most unwise. Such an effort would restrict aggregate demand so severely as to increase greatly the risks of a very serious business recession. 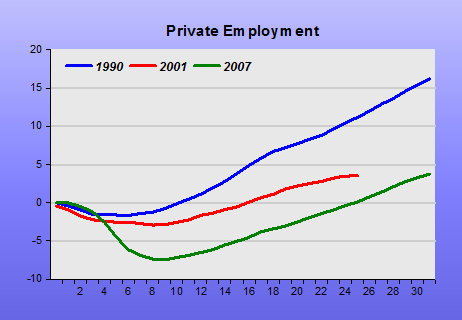 In his view, monetary policy could at most mitigate the unemployment effects of supply shocks. No wonder nominal spending growth showed a rapidly rising upward trend all through the 1970s. High and rising inflation was the consequence. Economic policy has a kind of crisis of credibility. As a result, dramatic action to combat inflation would not receive public support without more of a crisis atmosphere. I define the seven-year period going from the fourth quarter of 1979 to the fourth quarter of 1986 as the “Volcker Transition.” That is when the US economy transitioned from a high inflation and high volatility regime, to one characterized by more-stable real output and lower and steadier rates of inflation. The result of the Volcker Transition is the “Great Moderation” that extends, under Greenspan, from 1987 to 2007. Bernanke´s misguided monetary policy, heavily influenced by fears of inflation from oil price shocks, broke the spell. 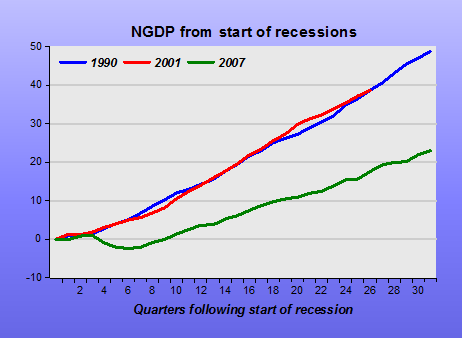 The outcome was the “Great Recession” regime, quickly followed by the “Great Stagnation” regime. The Great Recession of 2007-09 was a dramatic macroeconomic event, marked by a severe contraction in economic activity and a significant fall in inflation. These developments surprised many economists, as documented in a recent post on this site. One factor cited for the failure to anticipate the magnitude of the Great Recession was a form of complacency affecting forecasters in the wake of the so-called Great Moderation. In this post, we attempt to quantify the role the Great Moderation played in making the Great Recession appear nearly impossible in the eyes of macroeconomists. In sum, our calculations suggest that the Great Recession was indeed entirely off the radar of a standard macroeconomic model estimated with data drawn exclusively from the Great Moderation. By contrast, the extreme events of 2008-09 are seen as far from impossible—if unlikely—by the same model when the shocks hitting the economy are gauged using data from a longer period (third-quarter 1954 to fourth-quarter 2007). These results provide a simple quantitative illustration of the extent to which the Great Moderation, and more specifically the assumption that the tranquil environment characterizing it was permanent, might have led economists to greatly underestimate the possibility of a Great Recession. The upshot is that the new approach delivers a very simple forecast of U.S. macroeconomic outcomes over the next two and a half years. Over this horizon, the forecast is for real output growth of 2 percent, an unemployment rate of 4.7 percent, and trimmed-mean personal consumption expenditures (PCE) inflation of 2 percent. In light of this new approach and the associated forecast, the appropriate regime-dependent policy rate path is 63 basis points over the forecast horizon. The chart below comprises the period considered by Liberty Street. 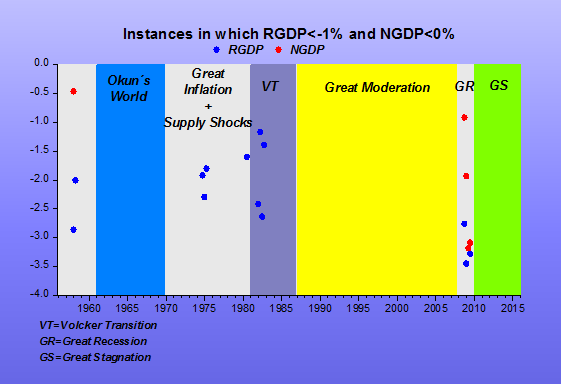 Note that in the late 50s, the relatively small and brief negative NGDP growth was sufficient to thump RGDP growth, even harder than the supply shocks of the 70s or the tightening of spending during the Volcker Transition. According to Robert Lucas (Econometric Policy Evaluation, a critique, 1976), forecasts are regime dependent. So, if you change policy, you change the regime (and also the forecasts). Liberty Street estimates the model across regimes, so that the Great Recession becomes “far from impossible”. I identify the Great Stagnation regime as a low volatility regime. That characteristic (low vol) is shared with the Great Moderation regime. But that is very misleading. Once you take into account the different nominal and real growth rates in the two periods, you understand how “sub-optimal” the present regime is! The Tables below illustrates for the 2010-2016 and 1992-1997 (halcyon days of the Great Moderation). Certainly a steep price to pay for having inflation a bit below target! But there are also risks to forestalling rate increases for too long when we are continuing to make cumulative progress on our policy goals. Waiting too long increases risks to financial stability and raises the chance that we would have to move more aggressively in the future, which poses its own set of risks to the outlook. I believe waiting too long also jeopardizes our future ability to use the nontraditional monetary policy tools that the Fed developed to deal with the effects of the global financial crisis and deep recession. If we fail to gracefully navigate back toward a more normal policy stance at the appropriate time, then I believe there is a non-negligible chance that these tools will essentially be off the table because the public will have deemed them as ultimately ineffective. This is a risk to the outlook should we ever find ourselves in a situation of needing such tools in the future. Bullard seems to have “holstered his gun”. However, his reasoning is reversed. It´s not monetary policy that is regime-dependent, but the regime that is monetary policy dependent. If he switched his reasoning, switches between regimes would become forecastable! Regimes are generally viewed as persistent, and optimal monetary policy is viewed as regime dependent. Switches between regimes are viewed as not forecastable. The Fed really needs a makeover! If it isn’t bad enough that the mainstream model is driven by two unobservable variables — the neutral rate and the real rate — James Bullard wants to convince us that policy decisions are based on regimes that are unknown and, even better, switches between regimes that are not forecastable. Does this in anyway differ from a Ouija board? The FOMC or the Market? The FOMC median projection for the policy rate suggests a gradual pace of rate increases over the next several years. The market-based expectation for the FOMC policy rate is much shallower, implying only a few increases over the forecast horizon—almost no normalization. US. evidence from labor markets, actual inflation readings and global influences suggests the FOMC median projection may be more nearly correct. US. evidence from recent readings on GDP growth and market-based inflation expectations suggests the market view of the path of the policy rate may be more nearly correct. Ladies & Gentlemen, place your bets! PS Note how monetary policy has been downgraded to establishing a “normal” level of the FF rate. And by “devine coincidence” that “normal” level will provide the “target” rate of inflation. It´s a double “reasoning from a price change”! St. Louis Fed President James Bullard fully supported additional action but advocated for an open-ended approach to bond purchases (that the committee would later adopt in QE3). Not surprising that Bullard is surprised! The leader of the Federal Reserve is often described as among the most powerful people in the world. But in late summer, as the Fed weighed whether to raise interest rates for the first time in nearly a decade, Yellen found herself outnumbered. Yellen wanted to wait. The wild swings in global financial markets over the summer were potentially bad omens for China’s economy — which in turn could drag down America, she feared. But her colleagues were not as worried. A slim majority of the 17 people who make up the central bank’s top brass was willing to start pulling back the Fed’s support for the recovery in September. One of the most vocal officials has been St. Louis Fed President James Bullard. He often pushes the envelope of debate at the central bank, and he is the last top official to speak before the Fed’s big decision. In an interview with The Washington Post, he said not raising rates in September was a “mistake” and that the U.S. economy could be ready to take off. WP: When you review the last seven years that the crisis occurred and the actions that the Fed has taken since then, would it ever have entered your imagination in, say, 2007 that the Fed ever would provide as much stimulus as it did for the economy? Bullard: No, I would not in 2007 — certainly not in 2007, or even 2008 or 2009 — think that we would be in the position that we’re in today. Historically, when you had big shocks, you also had a period of bounce back that was stronger than what we actually got here. I certainly did not predict that things would linger this long, seven years later. I think that’s been the major surprise in the aftermath of the big crisis. Bullard never imagines that this time around there was no “bounce back” simply because he (and his colleagues) didn´t want one! 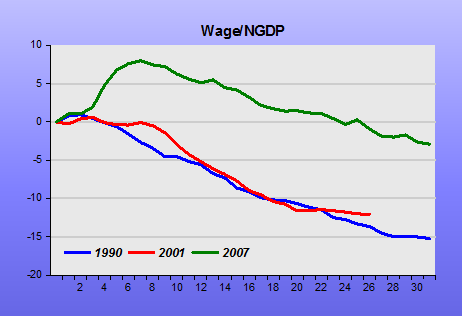 Why, one could ask, did employment rise much less robustly in the 2001 cycle than in the 1990 cycle, given that NGDP (and wage/NGDP) behaved similarly? 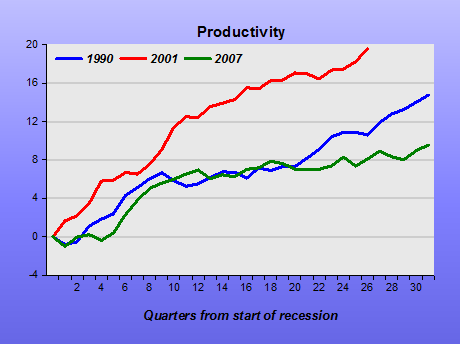 The reason is mostly due to the 2001 recession being a “productivity rich” recession. Why the hurry (to raise rates)? A tentative hypothesis is that of the 12 regional Fed presidents, 10 have never voted for an increase in rates! And some of them are voting members this season (which has three more meetings to go). Dennis Lockhart just entered his ninth year as president of the Federal Reserve Bank of Atlanta, and during that time he has never voted to raise interest rates. He took the job during the very early days of the financial crisis, and he has never really had the chance. But that is about to change. Mr. Lockhart said in an interview Monday that he expected he would vote to start raising rates by September at the latest. Federal Reserve Bank of Atlanta President Dennis Lockhart said the economy is ready for the first increase in short-term interest rates in more than nine years and it would take a significant deterioration in the data to convince him not to move in September. “I think there is a high bar right now to not acting, speaking for myself,” Mr. Lockhart said in an interview with The Wall Street Journal. “We are in good shape” for increasing the Fed’s currently near-zero short-term rate target at the Sept. 16-17 central bank gathering, Mr. Bullard said in an interview with The Wall Street Journal. He said officials needed to see how growth data released Thursday shaped up before clearing the way to act. They must be feeling pretty useless, being paid without doing any real work!